A double from Glenn Murray helped Brighton fight back from 2-0 down to draw 2-2 with Fulham at the Amex this afternoon. Andre Schurrle's 43rd-minute strike gave Fulham the lead at half-time, after Albion midfielder Pascal Gross saw a penalty saved by Marcus Bettinelli midway through the opening half. The visitors made it 2-0 on 63 minutes when Aleksandar Mitrovic pounced on a mistake by Lewis Dunk to score at the second attempt after Mathew Ryan saved his first effort. Glenn Murray got a goal back from Anthony Knockaert's pass on 67 minutes, before he equalised from the penalty spot six minutes from time after Mitrovic was penalised for handball. Albion made two changes from the 1-0 defeat at Liverpool last weekend as Dunk returned from an ankle injury to replace Leon Balogun in central defence and Gross came in for Yves Bissouma. Fulham brought in Alfie Mawson and Andre-Frank Zambo Anguissa for Joe Bryan and the injured Tom Cairney from their 4-2 victory over Burnley last week. Brighton made a strong start and forced five early corners but the visitors created a decent opening on 16 minutes. Luciano Vietto skipped past a couple of challenges and fed Andre Schurrle, whose cross from the left was headed over by Mitrovic from ten yards out. The Seagulls had a golden chance to take the lead midway through the first half as referee Lee Probert pointed to the penalty spot after Vietto fouled Murray. However, Gross's spot-kick low to Marcus Bettinelli's right was pushed away by the Fulham keeper for a corner - from which Murray headed Gross's delivery just wide of the far post. Murray fired over after Solly March nodded the ball back into the penalty area on 34 minutes, before March had a shot blocked three minutes later and Dale Stephens blazed over from distance moments later. Fulham went ahead two minutes before half-time as Jean Michael Seri's lovely ball over the Albion defence was turned home by Schurrle six yards out for the German winger's second goal in as many games. Schurrle curled a 25-yard free kick wide in the first chance of the second half on 53 minutes. Brighton had a great opportunity to level just three minutes later as Davy Propper's pass put March through one-on-one but Albion's winger blazed over from 15 yards. Fulham doubled their lead on 63 minutes as a mistake by Dunk allowed Mitrovic to break through and after his first effort was saved by Mathew Ryan, the Fulham striker fired home the rebound for his fourth goal of the season. Albion responded quickly and got a goal back four minutes later as Knockaert broke forward and slid in Murray, who side-footed home from ten yards. Both sides made double substitutions with quarter of an hour to go and Seagulls sub Jurgen Locadia had a header saved on 78 minutes. Brighton were awarded their second spot-kick on 84 minutes when Mitrovic was penalised for handball and Murray sent Bettinelli the wrong way to net his third goal of the season. Murray had a late header comfortably saved by Bettinelli and Martin Montoya flashed a volley wide as the game ended 2-2 after five minutes injury-time. 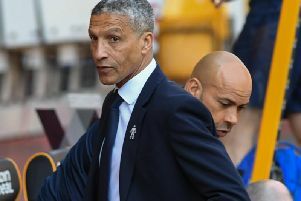 Brighton: Ryan; Montoya, Duffy, Dunk, Bong; Knockaert (Janbakhsh 74), Stephens, Propper (Locadia 74), March; Gross (Bissouma 60); Murray. Subs: Button, Kayal, Balogun, Bernardo. Fulham: Bettinelli, Odoi, McDonald, Mitrovic, Vietto (Sessegnon 74), Le Marchand, Fosu-Mensah, Seri, Mawson, Zambo Anguissa (Johansen 74). Subs: Fabri, Chambers, Christie, Bryan, Kamara.